From Original Hustler to founder of one of London’s most innovative and honest agencies YOU Management’s Terence Rodia is someone you don’t want to miss. Working hard alongside his long time friend Kiri John, they are doing things their way by striving to always put their performers first. Find out if they are the right agency for YOU! It should first be noted that Terence is one of ‘The Original Hustlers’, that is correct! When The Hustle started it was simply a group of friends sharing audition information and helping each other make a living. This very same ethos is still present in how Terence and Kiri have decided to run YOU Management and it is the same way of thinking that sets them apart from others in the industry. I started working as a dancer on a cruise ship when I was 19, I did a couple of contracts and then became a choreographer for the company, installing shows and producing my own. I did this for a couple of years, but my passion was musical theatre. I then got We Will Rock You, which made me move out to Germany where I performed in several more shows, also continuing to choreograph on the side. This passion was clear to see in Terence from an early age when he produced his first show at age 10, by rounding up all the kids in the street where he lived. Together they made costumes and built a small stage, where they performed sketches and routines that Terence choreographed. He even had a name and logo for the company which later formed the colours of YOU Management. However behind every great man there is often an equally impressive women and Kiri is just this. This business partnership is born out of an on and off stage friendship that has stood the test of time. Kiri also comes from a strong performing background, but due to unfortunate events she had to give up her stage career early. I trained at the Northern Ballet School and then went to work for Belinda King in Portugal, from there I went straight on to work for PGT Entertainment in Florida and on board 6 star ships, which is where I met Terence. I worked my way up to Dance Captain and assisted some of the shows with Terence so we have always been working closely together, as well as choreographing on my own. Unfortunately I got injured, I slipped two disks in the top of my back and as a result I had to retire from performing. It was always our dream to open up an agency and when the time was right for me I came on board. There are many ex-performers out there who have also considered starting agencies as who knows the business better then us. However I think this blend of careers is what enables YOU to give a unique service. It is being driven by two people who understand many different aspects of a performers life from both the highs and lows and have worked hard to ensure they can be a support for both. The reason we wanted to start the agency is because we always said we could do this so much better and not screw over the artists, this was a dream we had when we were still performing. We didn't want to be in it just for the money. It is this personal experience that has motivated Terence to ensure that he always places his clients careers as the main focus. In order to do this he has built a strong team around him starting with Kiri and Natasha who have been with him since day 1. YOU has also expanded to the German speaking market with a second office running in Germany. I’m sure you are already seeing the attraction to having an agent like this, but I think what truly sets YOU Management apart is the understanding of what their role is. They are not just sitting on Spotlight clicking a button finding the easiest way to earn their commission, instead they are working hard to build real relationships with everyone they come into contact with. We pride ourselves on trying to get a really personal relationship with the casting directors too, so they don't see us as just another agent, we like them to say its Terence and Kiri from YOU Management, we know their clients are amazing and of such a high standard. It’s not just about the computer, it’s about talking and hustling. We are about the artist, we are artists that want to support other artists. When new graduates ask me where should their career go? I always say, that’s not for me to decide, my job is to know where you want to be and to make that happen. Of course we are realistic, and ultimately we are there to support them in what they want to do. In my point of view, a big part of being an agent is to support them throughout every step in their career, from getting them an audition to celebrating a great performance; as an example I flew to Copenhagen last year to see Sarah in her opening night of Dirty Dancing and she said for all the years she had worked in the West End, her agent had never gone to see her perform but I came all the way to Denmark. I went because I wanted to support her and be there for her. We aren't a massive machine run agency, we like to know our clients by name and on a personal level, so we can have a great relationship with them rather then just looking at pictures on a board in the office. I love watching them grow and develop, we follow their career and watch them on stage it’s completely different to when you auditioned them, you may see something in them they you would never have seen otherwise. It’s clear to see that Terence and Kiri’s dedication to providing the best they can for each performer is more then most. They have not set out to start a ‘get quick rich’ scheme by ripping people off and this is outlined in the companies highly fair commission rates. I’m sure by now you are wondering how to get on the books of such a supportive, dedicated and successful agency, so I asked Terence and Kiri exactly what is it they look for in a performer? Talent. A drive, they have to want it, they have to be committed to it, not sitting at home waiting for an audition to happen. If someone comes along to an audition and they aren't the industry ‘norm’ but they have something it’s so exciting I can see it and I want to nurture them. Sometimes it’s the under dog that I love working with, because I strive to bring out the confidence in someone, even if they don’t believe in themselves, I push them so they can. Their advice for getting representation is just as valuable, you should take your time, especially if you are a new graduate, make sure you weigh all your options. Of course this is hard but its in your best interest to get to know all opportunities, meet with different agents and then decide. It’s also important to get yourself out there, once you have graduated, you have to keep going to take classes, you have just stepped on the ladder and it’s a process, you have to work your way up. We have two different concepts for new graduates, some say they want to stay in London and be seen by every casting director possible. Others say they want to go away and work for a year or two on a ship or somewhere else, get experience, grow and develop so they can come back once they are a little more mature and then be seen by all the UK casting directors. Option 2 worked for me but to graduates nowadays I would recommend to give the UK a shot first before going away, though we would of course support and respect either choice. I have only ever pushed a client to take a job and go away once, and a year later when she returned all she could say was thank you and that, her time at Universal Studios Japan was the best thing she had done in her life so far. Drew Maconney (In The Heights, London) Jerry Mitchell: He really know how to work the stage and let magic happen. Barre Core - I love the mixture of Pilates, Ballet, and core strength building. 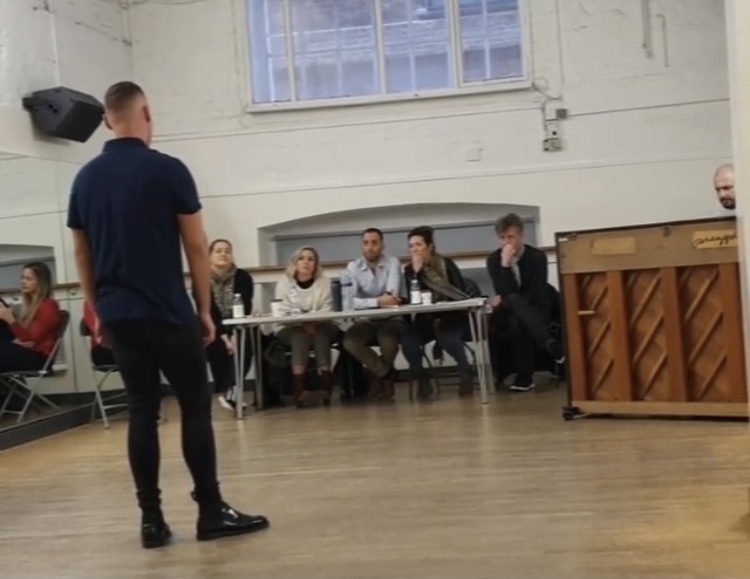 I like to take real musical theatre classes but I don't feel like we really have that here in London, I would like to put out a shout out for one. A Chorus Line - It was the first show I ever saw, I remember watching it on VHS when I was 7. A Chorus Line - I did the show with Baayork Lee and have learnt so much of the back story which makes the piece even more inspiring. It’s an amazing show, because it’s not about performers trying to break into the business, its about dancers that are in the business. It’s our lives and it’s so personal for everyone. At this point, both Kiri and Terence start to tear up, thinking about the show. I always wanted to work in something that I loved, something that my soul was happy doing. A pilot - I still want to get my pilots license, I almost went to aviation school when I was younger. My Mum - She was a single mum who bought me up with my nan. I didn't get a scholarship for Northern ballet school so they put all their savings together so I could go. My mum - She's a dancer, she comes from show business so she always knew what an artist has to go through and she gets me. What does the hustle mean to you? It’s a great way for different performers to connect, it started out as a group of friends just helping each other out with auditions and borrowing dance wear. It was just this close group of friends who wanted to help each other out in the business and its still that now. Even though it’s 35,000 people it’s still a group of people that share a passion and want to help each other. What is clear to see is that YOU Management tries to represent each and every one of their clients in the best way possible, this can often mean becoming a mentor, a tutor and confidante.They are an agency that will believe in you even if you are struggling to believe in yourself, they make it their mission to make YOU successful.